Paeonia Mother's Choice is a wildly popular peony, with perhaps the most beautiful buds of all. The flowers can grow to a whopping 20 cm wide and have a lovely ivory white colour. Breathtakingly beautiful! 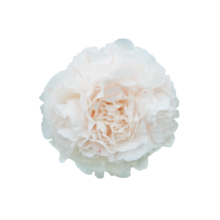 Mother’s Choice is a full-flowered peony with flowers that bloom in the shape of a rose. Colourwise, they start out ivory white and develop a slight hint of champagne during the blooming process. A peony fit for royalty. Although the flowers can grow huge in size, the stems often remain pretty short. They are usually sold with stems cut at a length of 50 cm. Mother’s Choice is harvested a bit sooner than that other popular peony, Sarah Bernardt. The variety grows at its best in countries like France, Italy and Chile, where there’s an abundance of sunlight. In the Netherlands this variety has a tougher time growing. Mother’s Choice is not an easy peony to grow. It takes a professional grower to get the best results. This variety needs a lot of attention, because it is susceptible to Botrytis cinerea. Cut Mother’s Choice at the right stage of maturity. Not too soon, because that will mean the buds will never open, but certainly not too late, because it will bloom too early. Mother’s Choice was registered in 1950 by the American breeder Glasscock who is als notorious for varieties as Red Charm and Red Grace. Paeonia Mother’s Choice is in a class of its own and that, naturally, comes at a price. To fully enjoy this luxurious variety, make sure that you buy it at the right stage of maturity, cut the stems diagonally and put it in a clean, water filled vase with a little bit of flower food.